Stampin Up What Does It Have To Offer You? What Does Stampin Up Have To Offer You? Card makers? Scrappers? Paper crafters? Are you looking for really good quality rubber stamps, inks, papers, accessories, punches, ribbons and card stock? Stampin Up has, for over 20 years, helped people like you be creative and enjoy the fun of stamping, scrapping and making personalized paper-craft gifts. Let me tell you a little about how to obtain a free Idea Book & Catalogue, (valued at $12.95), how you can order Stampin Up products at 20% discount, and how much I have enjoyed being a part of Stampin Up's three years in Australia. You can browse the catalogue by clicking on the book image. in this we make a difference"
This is Stampin Up's Statement of the Heart. If you speak to any demonstrator, they will tell you just how true this statement is. Having started in Utah, USA 20 years ago, the company now operates in the USA, Canada, Australia, New Zealand, and parts of Europe. It is an award winning direct sales company that sells its products through Independent Demonstrators. There are many types of Stampin Up demonstrators who may conduct workshops, classes or other events to introduce the products to potential and repeat customers, show them how to use the products in a number of ways, and help them develop creativity while having lots of fun. Essentially, your demonstrator is your personal creative coach. I became a demonstrator after one session at an opportunity night. I had no knowledge of rubber stamping, but I did have a love for craft of all sorts. I was so impressed by the energetic, caring company representatives, the strong support offered and the fabulous quality of the products they encouraged us to use that night, that I signed up right away. A couple of months later I was lucky enough to travel to the USA, so I went to visit the Stampin Up Home based in Utah and found a very impressive operation. As you can tell, I have a huge admiration for Shelli Gardner (co-founder of Stampin Up) and the integrity of the company. Demonstrators receive an instant 20% discount off all their personal purchases, earn an instant 20% income from customer orders, plus they have the opportunity to earn commissions. If you haven't already browsed the What type of Demonstrator could you be? brochure, have a quick look now. You may be surprised at the variety of Demonstrator options, and I know you would love to get that 20% discount on stamp sets, papers, punches, ribbons and inks. 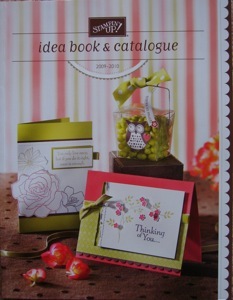 If you would like to have a peek at the catalogue on line, click here. You can order your own hard copy from me for the tiny price of $12.95 plus P & H. Then all the ideas and projects contained in the catalogue will be available for your easy reference. In the Catalogue you will find life size pictures of all the stamp sets available for the current year (until March 31st, 2009). There is information on accessories, (including the fabulous cropodile), card stock and inks and their co-ordinating colour families. Hundreds of creative ideas and uses for the stamps and accessories are available as inspiration for you, and yes you can copy these if you need a little creative help at times. Now if you would like a Free Catalogue you can have one when you book a workshop with me. I do workshops all over the Canberra and surrounding regions, but if you live too far away or in remote areas of Australia, do not despair. You can organize a Catalogue Party where you show the catalogue, or gather orders from friends to a minimum value of $300.00, and both a free catalogue and some Hostess Benefits will be yours. Hostess Benefits (free stamps and $'s to spend on catalogue products) are available to anyone who would like to enjoy some free merchandise, and have fun in the process! You can request a Free Project Tutorial if you live in a remote area and would like guidance in creating a particular project. How Do I Become a Workshop Hostess? how to host a Stampin' Up! workshop. how I can learn new stamping techniques. how I can earn FREE stamps. Minimum sales totals apply to be eligible for the Hostess Benefits, but , with a little consultation, I can assist you to reach your goals. There are no minimum order totals for individual orders. If you love craft, and you're looking to earn a little extra income or would like to develop a craft group, and you live in a remote area, the Demonstrator Opportunity may be just what you are looking for. As one of my team, you will enjoy friendship and interaction with other team members, receive newsletters containing tips and techniques, and have exclusive access to restricted areas of my web-site. You will also enjoy access to the Stampin Up Demonstrator web-sit, which is full of information and ideas, and have the opportunity to attend regional training and the annual Convention. You can find more information about joining my "distINKtive stamping designs" team by using the contact form above. Look here to see examples of what you could make with Stampin' Up!